Abe’s More Assertive Japan: Will He Defy Expectations Again? 作者: The AsiaN Editor on 1 November , 2018. Japan’s Prime Minister Shinzo Abe, in power since 2012, has consistently defied expectations. He first came to the office in 2006, as the protégé and successor to Japan’s most popular and arguably most successful post-war prime minister, Junichiro Koizumi. By skilfully using a major electoral reform in 1994 and an administrative reform in 2001 that enhanced the leadership of the prime minister, Koizumi brought about major changes in Japan’s economic and security policies. Abe also was popular at first, despite being known as a nationalist and as the grandson of the disgraced Prime Minister Nobusuke Kishi, who resigned after mishandling the 1960 US-Japan Security Treaty crisis. There were high expectations for him as Japan’s youngest post-war prime minister, Koizumi’s lieutenant and a well-known fourth-generation politician. However, the first Abe administration failed to meet expectations and was marked by repeated scandals among his cabinet ministers, while he concentrated on foreign affairs and largely ignored domestic policy reforms needed to help Japan emerge from its decade and a half long recession. Also unpopular was his desire to advance Japan’s military, the Self-Defense Forces (SDF), which he upgraded to a full-fledged ministry during this term, as he sought to make Japan a more assertive power. He also stumbled in denying Japan’s culpability on historical memory issues and its brutal role in the Pacific War. Abe lasted only one year. After his ruling conservative Liberal Democratic Party (LDP) — the party that had governed Japan for all but a year since its formation in 1955 — lost an Upper House election, he resigned due to ill health amid falling approval ratings. The increased influence of the prime minister proved that it could result in either great success (Koizumi) or speedy failure (Abe’s first term). Abe was followed by two short-term LDP prime ministers, contributing to the more liberal major opposition party, the Democratic Party of Japan (DPJ), taking power in 2009. At this point, no one would have predicted the resurrection of Abe’s leadership career. The DPJ came to power with a popular domestic platform that promised more welfare but also lower taxes. In foreign policy, its first prime minister, Yukio Hatoyama, withdrew Japanese supply ships from the Indian Ocean, where they had been refueling and supplying non-military goods to US and coalition forces in Afghanistan. His administration also tried to cozy up to China. Hatoyama pushed for a complete withdrawal of the controversial Marine Corps Air Station Futenma, a major US air base on Okinawa, which the US military considers the “keystone” of its Pacific strategy in Asia. This came after the US and Japan had spent over 13 years negotiating an agreement to move the base to a less populous part of the prefecture and a partial withdrawal of US marines from Okinawa to Guam. None of these DPJ policies came to fruition and Hatoyama’s three years in power proved to be a disaster, figuratively and literally. The DPJ’s contradictory domestic policies were only partially fulfilled. Its policy of closer relations with China was torpedoed by an incident near the disputed Senkaku/Diaoyu Islands, administered by Japan but claimed by China. A Chinese fishing boat — one of many along with Chinese military vessels that constantly challenge Japan’s protection of the islands — rammed a Japanese coast guard cutter patrolling the area. The government embarrassingly mishandled the incident. The most dramatic self-inflicted failure of Hatoyama’s administration, however, was the push to move the Futenma base out of Japan completely. Although the Japanese public fully supported reducing the burden of Okinawa as the prime host area for the US military in Japan, it also had the contradictory attitude of also being totally opposed to moving any bases to anywhere else in Japan. Hatoyama also failed to get the US to agree to move the disputed base to Guam, the other US military bastion in the Pacific that was already brimming with US forces and was expected to host more with the promised withdrawal of a portion of the Marine forces stationed on Okinawa. Lacking any leverage to pressure the US on the base issue, especially at a time of increasing tensions with North Korea and China, the result was predictable: only a minor face-saving agreement for the US to scale down other bases a bit, which infuriated the Okinawans. The Japanese public’s once-strong support for the DPJ faded away with the realization that an ineffective administration could not fulfill its promises nor maintain stable relations with Japan’s main ally. Hatoyama resigned in 2013 with low approval ratings and trust in his party shattered. The next two DPJ prime ministers weren’t as bad. However, one, Kan Naoto, was unlucky in having the triple disaster of a massive earthquake, tsunami, and nuclear plant meltdown in the Northeast of Japan on March 11, 2011. During the disaster, the power company that owned the nuclear plant misinformed Kan, and later much prior regulatory failure was revealed. His government also bore some responsibility because of its lack of transparency during the crisis, and its slow response after the disaster. All the resulting problems, fairly or not, were blamed on Kan and he resigned after a year. The final DPJ prime minister, Yoshihiko Noda, personally lacked voter appeal and bravely approved a rise in the very unpopular consumption tax. When he finally called an election in 2012, the resulting DPJ loss was expected. What was unexpected was who would lead the LDP back to power: Shinzo Abe. Somehow, despite his earlier failed premiership, Abe convinced his party to take him back. Indeed, in the 2012 election, Abe seemed to have learned his lesson, emphasizing “Abenomics,” as the press dubbed it, not foreign and security policies. This policy promised to revive Japan’s long-stagnant economy by using “three arrows” — fiscal and monetary stimulus plus structural reforms. Along with the very deep disillusionment with the DPJ, this proved to be a winning combination for the LDP. It won a landslide victory under Abe, and his surprising comeback had defied expectations again. Early in his term, Abe implemented the promised fiscal and monetary stimulus, and some structural economic reforms (although not as many as had been hoped) while the economy struggled to grow. By 2017, there had been moderate growth again, with unemployment dropping to below 3 percent, its lowest level in 23 years. His fiscal and monetary moves, however, exacerbated Japan’s huge debt, now the largest in the industrialized world at almost 2.5 times gross domestic product (GDP). To address this problem, Abe raised the unpopular consumption tax from 5 percent to 8 percent, but when the economy began to slide again, he postponed a further increase to 10 percent. 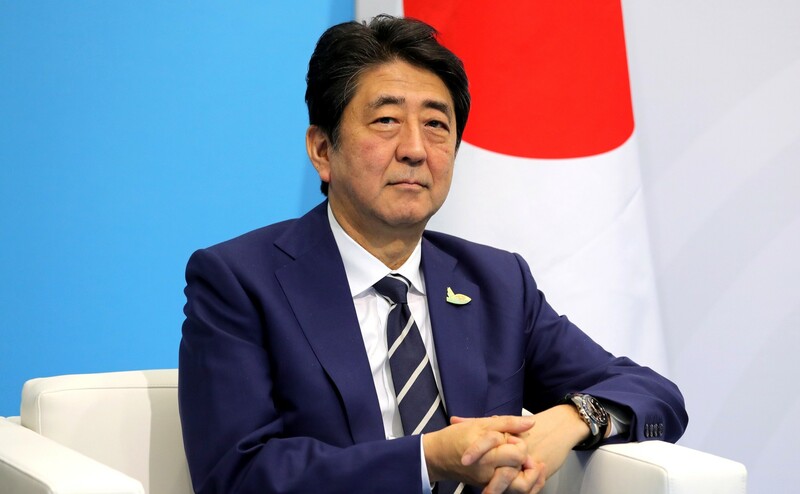 Despite the hype and even limited success of Abenomics, many of his key domestic and foreign policies have gotten mixed reviews, and some are downright unpopular, such as his decision to restart nuclear plants after the March 2011 disasters. Although the public retains hope in Abenomics, polls have shown they don’t think it is working that effectively. His stance in his first administration on historical memory issues, including visiting the controversial Yasukuni Shrine where Japan’s war dead including Second World War war criminals are enshrined, and his sending offerings to the shrine since then, still polarizes the public and worsens relations with China and South Korea. It is, however, his security policies that are especially lacking in support. Abe’s long-time desire is to make Japan a more assertive foreign player by legitimizing its military and building the capability to support its US ally abroad. Ultimately, he wants to revise the post-war Article 9 of the “peace constitution” that literally forbids Japan from waging war or having armed forces. To place his goals in their proper context, despite Article 9, Japan has never been a “pacifist” country, as the mass media frequently and wrongly insist. There has always been public support for the defense of Japan itself and for the Self-Defense Forces, a quarter-million person military except in name, and now with the second strongest navy in the Pacific. What gradually developed among many Japanese in the decades after the war was not “pacifism,” except among a minority, but rather what Thomas Berger has more accurately termed an “anti-militarist” subculture. What much of the public has always opposed is becoming embroiled in military interventions alongside the US outside of the defense of Japan, and “collective defense,” i.e., militarily defending the US. Indeed, there is no literal obligation for Japan to do either under the US-Japan Security Treaty, despite the obligation for the US to defend Japan. In short, much of the Japanese public continues to support the former “Yoshida Doctrine,” the main LDP security policy from the 1950s through the 1990s, which called for maintaining a minimal military force and relying primarily on the US to defend it in a crisis. This is still largely true despite the public’s growing fear of North Korea and China. Building on some of Koizumi’s previous revisions of the Yoshida Doctrine, such as sending Self-Defense Forces abroad for non-combat missions in Afghanistan and Iraq, Abe has gone much further. Among other changes to previous limits on Japan’s security policies, he has established a National Security Council to co-ordinate ministries’ responses to crises; passed Japan’s first National Secrets Law; relaxed Japan’s weapons export ban to the US and US allies; tried to bring cyberspace and space into the US-Japan security guidelines; allowed the SDF to provide refueling and medical aid to UN-sanctioned multinational military operations even in previously forbidden combat zones; and tried to create de facto political alliances with other Pacific democracies (notably except for South Korea) to counter China’s rising influence in the region. Abe arguably has already accomplished more to change security policies and make Japan’s foreign policy more assertive than any previous prime minister. Even this limited change, however, has been quite unpopular with a public deeply opposed to collective defense directly or indirectly. In a book in progress comparing Japan and Germany under their respective postwar “peace” constitutions (tentatively titled Reluctant Warriors, Conflicted Allies) four co-authors and I found that although Japan has moved away from its very anti-militarist Cold War security policies, Germany has done more than Japan, including combat roles in Afghanistan in support of the US. No SDF soldier has ever killed or been killed abroad in combat in the post-war era. Japan’s stronger anti-militarist subculture has forced Japan’s elites to be more wary, circumspect and restrictive about military intervention than Germany. Nevertheless, despite the limited popularity of his policies, Abe has continued to win elections. The LDP won general and/or Upper House elections under Abe in 2012, 2013, 2014, 2016 and 2017. How do we explain yet another case of Abe’s defing expectations? Three main factors are at work. The first is the deep distrust of the opposition parties, a fact among voters since the ruinous term of the DPJ. Second, the opposition parties continue to splinter and form new parties, none of which command anything near the LDP’s support, leaving much of the public feeling as if there are few alternatives to the LDP. Third, Abe’s electoral tactics have been craftily successful, tactics Professor Ethan Scheiner of the University of California at Davis has labeled “bait and switch.” During campaigns, Abe focuses on domestic policies, including his hope for “Abenomics” to become more effective while using the consumption tax more for welfare purposes. With the election successfully over, he re-focuses more on his foreign and security policies. Abe is the odds-on favorite in the September 2018 LDP election for party leader and thus prime minister. If this happens, Abe may very well become the longest-serving prime minister in the post-war period, surpassing Eisaku Sato’s seven years (1965-1972). Yet, despite his accomplishments, Abe now faces his greatest challenges, both in his economic relations with the US and in fulfilling his most desired and difficult security goal. Donald Trump’s policies have created problems for Abe, as for other world leaders. As a fellow conservative, Abe thought he could handle Trump by establishing a personal relationship. He was the first foreign leader to visit Trump after the election, and has cozied up to him, playing golf with him several times. At first it seemed to work, as Trump initially avoided criticism of Japan’s trade policies, unlike his criticism of Germany. But then, as is Trump’s wont, he seemed to betray even Abe. First, he withdrew from the Trans-Pacific Partnership (TPP) trade agreement that Japan strongly supported, leaving Tokyo to push ahead with its successor, the Comprehensive and Progressive Agreement for Trans-Pacific Partnership (CPTTP), without the US. And despite Abe’s efforts, Trump has thus far refused to exclude Japan from threatened high automobile tariffs. His other great challenge is constitutional revision, Abe’s most cherished foreign policy goal before he leaves office. The LDP is pushing to amend Article 9, which would be the first amendment to the Constitution since it was established in 1947, keeping some of its anti-war wording but clarifying the legality of the SDF. He can probably get it through the Diet because he and his coalition partner, the CGP, have more than the two-thirds majority required. However, it must also pass a national referendum with a majority and this is very uncertain. Polls indicate that 50 to 70 percent of the public do not support revision. Can Abe defy expectations yet again to achieve his goal? Either way, his controversial administrations have already done more to change Japan’s security posture than anyone expected. Whether he manages to pass a constitutional revision or not, he will not have resolved Japan’s deep security contradictions, which pit public anti-militarism and the Constitution’s wording against Japan’s military and security reality. Large gaps will remain between the legal framework and Japan’s military power; and between a still strong, if diminished, anti-militarist culture that ignores Japan’s threatening security environment while resisting the heightened expectations of its essential ally, the US.